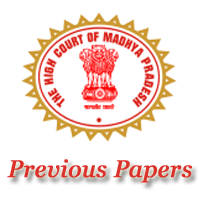 MP High Court Civil Judge Previous Papers that are available here now for downloading. Hence the aspirants who have applied for the Senior Civil Judge Jobs can check these Exam Old Question Papers for proper preparation. Hence, the Download Last 10 Years Madya Pradesh High Court Civil Judge Model Question Papers at free of cost from the following links. Also, check the official site of the High Court of Madhya Pradesh i.e. www.mphc.gov.in for further details about the Civil Judge (Senior Division) examination. Refer our web page Previous Papers to find exam papers. For the preparing aspirants of the Madhya Pradesh State Govt jobs, it is the latest recruitment notification. The High Court of MP has released 61 vacant posts for the Senior Division Civil Judge posts. Hence the aspirants who applied for the SD Civil Judge posts are in a hurry for the Madya Pradesh High Court Civil Judge Solved Question Papers. Because to begin the preparation, these Previous Year Question Papers of Civil Judge Exam are the best source. If you are also one of among those aspirants and are also browsing for the MP High Court CJ Previous Papers. Then you are in the right place where you can get the Past 10 Years MPHC Civil Judge Exam Question Papers in this article. Hence download and also start preparing for this Sr Division Civil Judge exam to obtain a better score. Also, visit the official site of the MP High Court i.e. www.mphc.gov.in for additional details about the exam. The Entry Level Exam of the MP Civil Judge Examination comprises of four sections. The four sections are namely Civil Laws & Procedure, Criminal Laws & Procedure, Writing Skills & Current Legal Knowledge and Judgement Writing, etc. Each section is for 100 Marks. Therefore the Entry Level exam is for 400 Marks. The Paper I comprises the topics, i.e., Constitution of India, Civil Procedure Code, Transfer of Property Act, Indian Contract Act, Specific Relief Act, Limitation Act and Hindu Marriage Act. The Exam is for 100 Marks. For complete details of the paper-1 is in the above table. The Paper 2 is for 100 Marks. CJ Exam Paper comprises of the topics that are shown in the above table. The Paper 3 is for 100 Marks. CJ Exam Paper 3 comprises of the concepts that are shown in the above table. In the Senior Civil Judge hiring process, there are 4 papers. Therefore refer the exam patterns for all the Civil Judge Exam Papers before beginning the exam preparation. Also, see the MPHC Civil Judge Syllabus for proper preparation. The providing details regarding the MP High Court Civil Judge Previous Papers are just for the reference use. Also, the participants can see the official site of MP High Court for additional details according to the Civil Judge examination.